For the purposes of this CD, I do not cover the length of Trail #31 which follows several miles along the Lewis River. My goal is to show you the beauty of the 3 major falls on the Lewis River and inspire you to visit these falls and if you have time, hike as much of the river trail as you can. Also, for the purpose of this CD all the photos I share were taken from legitimate trail locations, not from leaving the trail to climb down steep banks and walk out into the river for those very special shots. As you drive up Forest Road #90, you will come sequentially to the Lower, Middle, and Upper Lewis River Falls. At the lower falls parking area, it is just a short walk to viewing areas where you can get breath taking vistas of the Lower Lewis River Falls. One of the paths leads right out onto the river bed above the falls, and its steps are carved into the bed rock. The Middle Lewis River Falls trail is a bit longer than the lower. From the parking area, the trail descends gently to the river and flows it north to a viewing area below the middle falls. The Upper Lewis River Falls trail begins along Forest Road #90 just before the Quartz Creek bridge. 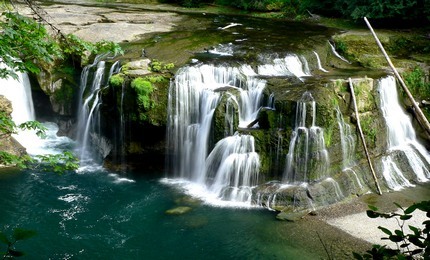 The trail gently follows the Lewis River downstream for about a mile where it then drops down next to the upper falls. 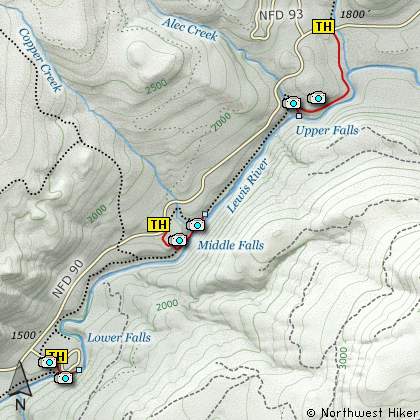 To get better views of the upper falls, one needs to follow Trail #31 further downstream and look back. From Woodland follow SR 503 and the Lewis River Road for about 48 miles to the community of Cougar, WA. From Cougar, continue east on the Lewis River Road which will turn into Forest Road 90 after you enter the Gifford Pinchot National Forest. In about 18.5 miles you will come to the junction of Forest Road 25. Turn right and remain on FR90 for another 4.1 miles and you will pass the junction to the Curly Creek Road. Continue on FR90 for another 9.9 miles and you will come to the main campground for the Lower Lewis River Falls. Turn into the campground area and follow signs to the parking area for hikers. To view the two other major falls on the Lewis River in this area, just continue east on FR90 and watch for the signs that direct you to the parking and trails for each. If however, you plan to approach this hike from the Columbia River Gorge area, then begin at Carson, Washington and head northwest on the Wind River Hwy. In 7.5 miles you will pass through the little community of Stabler, and in another 5.8 miles you will come to the junction of Forest Road 30. Turn right onto FR30 and follow this road for 13.2 miles north along the Wind River and then up a steep incline and onto a plateau where	you will come to the junction of the Curly Creek Road. Turn left onto the Curly Creek Road and follow it downhill past an excellent view area for about 5.1 miles until you come to Forest Road 90. Turn right onto FR90 and follow this road for about 10 miles and you will come to a campground at the Lower Lewis River Falls area. Turn into the camp area and follow the signs to trail parking.